The best places to celebrate Holi in India really depend on what kind of experience you want to have. You'll find activities taking place almost all over India, but they range from traditional temple rituals to modern parties with DJs, bhang, and plenty of colors. 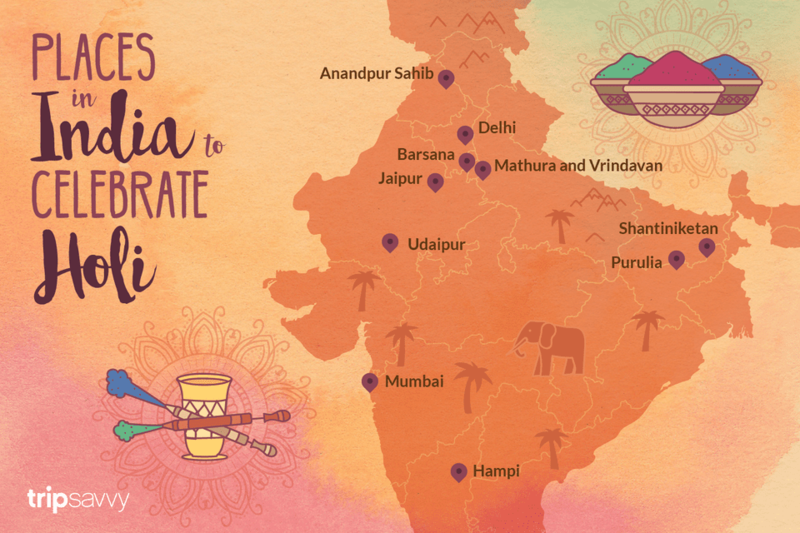 See which of these places, with totally different Holi festival celebrations, appeal to you the most. Want to know the meaning of Holi and find out when it's held each year? The answers are in this Holi Festival Guide, including important safety information and tips. Indian men don't always rule the roost! The women of Barsana and Nandgaon villages near Mathura in Uttar Pradesh beat up men with sticks, in what's known as Lathmar Holi celebrations. Unfortunately, this event isn't recommended for solo female travelers due to the disgusting behavior of men, who continue to go around molesting women. Dates: Lathmar Holi takes place in the week before the main day of Holi. In 2019, it will happen on March 15. The following day, the celebrations move to Nandgaon village. It's worth getting to Barsana a couple of days before Lathmar Holi so that you can also experience Laddoo Holi festivities there. Sweets are thrown around and spiritual songs related to Radha and Krishna are sung. Tours: Experience Lathmar Holi on this two day tour offered by Jaypore in conjunction with Breakaway In addition, 1100 Walks usually conducts a day trip to Barsana from Delhi. Holi celebrations get underway on Vasant Panchami (end of winter), 40 days before the main Holi day, in the temple towns of Mathura and Vrindavan, four hours from Delhi. Mathura is where Lord Krishna was born, while Vrindavan was where he spent his childhood. Dates: Sri Krishna Janmastham in Mathura holds a renowned show in the week before Holi. The week long celebrations at Banke Bihari temple in Vrindavan are also legendary, and culminate with the throwing of colors in the morning on the day before Holi (March 20, 2019). The celebrations start with the throwing of flowers (Phoolon Wali Holi) at 4 p.m. on March 17, 2019. In the afternoon on March 20, head to Mathura for the colorful Holi procession that starts from Vishram Ghat and finishes near Holi Gate. On Holi (March 21, 2019), the best place to catch the throwing of colors is Dwarkadheesh Temple in Mathura. Start the day early (at around 7 a.m) at Vishram Ghat to see priests making bhang. Tours: For safety reasons, it's highly recommended that women go on a guided tour such as this one offered by Agra Beat. The celebration of Holi as Basanta Utsav (Spring Festival) in Shantiniketan was started by famous Bengali poet and Nobel Laureate Rabindranath Tagore. Inspired by spring and the colors of Holi, he introduced the occasion as an annual event in his Vishva Bharati University there. Students dress up in spring colors and put on a huge cultural program for visitors, including dances to Tagore's songs. This is followed by the usual throwing of colors. Basanta Utsav has become a cherished part of Bengali history and culture, and it attracts numerous foreign tourists. Date: Note that festivities happen on March 20, a day earlier than the given date for Holi in other parts of India. A three-day Basanta Utsav folk festival takes place in the Purulia district of West Bengal. It runs in the lead up to Holi and on the actual day. You'll get to sing and play Holi with the locals, as well as enjoy a wide variety of unique folk art. This includes the remarkable Chau dance, Darbari Jhumur, Natua dance, and songs of West Bengal's wandering Baul musicians. What makes the festival special is that it's organized by villagers as a way of helping sustain themselves. The location is around five to six hours by train from Kolkata, or transport in private vehicles can be arranged. Accommodation is provided in tents and there are portable toilets as well. Tours: Contact Banglanatak for bookings and arrangements. Experience Holi the Sikh way at Anandpur Sahib in Punjab! Hola Mohalla is an annual fair that dates all the way back to 1701. It was first organized by Sikh Guru Gobind Singh to celebrate Holi. However, instead of throwing colors, expect to see a demonstration of physical agility. There's wrestling, martial arts, mock sword fights, acrobatic military exercises, and turban tying. Tours: Punjab Tourism offers a four day Hola Mohalla tour, including a farm stay. Breakaway also offers a Punjab Beyond the Brochure tour that includes the festival. Alternatively, travel independently and stay at the luxurious and conveniently located Citrus County farmstay. On the eve of Holi (March 20, 2019) people light bonfires to mark the occasion and ward of evil spirits in a ritual called holika dahan. For an unforgettable regal experience, join in the celebration of Udaipur's Mewar royal family. There will be a magnificent palace procession from the royal residence to Manek Chowk at the City Palace, including bedecked horses and royal band. Later the traditional sacred fire will be lit and an effigy of Holika burnt. Dharavi, Mumbai's largest slum, is not the depressing place that you may expect it to be -- and especially so on Holi. Reality Tours and Travel will take you on a fascinating (and uplifting) tour of the slum, and then to a Holi party that they will be throwing for the community at Dharavi. Join in and celebrate Holi with the locals in a safe and friendly environment, complete with colors and music. The cost is 1,400 rupees per person. 80% of proceeds are devoted to helping the people of Dharavi. If you're in Delhi, Reality Tours and Travel organizes a similar Holi event in Sanjay Colony. Holi tends to be a rowdy affair in Delhi. If you're staying anywhere near Paharganj, be prepared to be covered in color by shopkeepers and children alike if you step outside. If you can, try and get tickets to the Holi Moo Festival (previously the renowned Holi Cow Festival). This festival of color, moozik and madness has more than 40 Indian and international performers spread over four stages. The environment is safe, and non-toxic colors are provided, along with bhang lassi, street food, and sprinklers to get everyone in the mood. Plenty of expats, as well as locals, attend. You can find out more about Holi Moo on Facebook. An elephant festival kicks off Holi celebrations in Jaipur every year on Holi eve. Elephant parades, elephant beauty contests, folk dances, and tug-of-war between elephants, locals and foreigners are all regular events. It makes Holi extra fun! Note: this event hasn't been held since 2012 due to pressure from animal rights groups. If you do want to attend a local Holi festival celebration in Jaipur with elephants, try Eleholi. There's more information this article, including other alternatives for celebrating Holi in Jaipur. While in Jaipur for Holi, don't miss Vedic Walks' special Holi walking tour. If you're looking for an exuberant Holi, south India is generally best avoided. As Holi is primarily a north Indian festival, it's quite subdued at most places in the south. The focus is mainly on religious aspects and temple rites. However, Hampi in Karnataka is a notable exception! The whole town turns out to play Holi in the morning (perhaps for the benefit of the many western travelers there), amid drumming, dancing, and the evocative ruins of the grand Vijayanagar empire. Afterwards, the crowd slowly moves to the river to wash all the color off.